ARE BATHROOM SCALES HELPING OR HARMING YOUR WEIGHT LOSS PROGRESS? Many people use bathroom scales as a tool to gauge progress towards their weight loss goal. But how often should you step on your scales to record your body weight? I mean, is it really a good idea to weight yourself every single day? Many people view daily self-weighing in a negative light. The thinking behind this being that recording bodyweight every day can lead to obsessive tendencies and negatively impact your emotional health and sense of self-esteem. A 2016 study of studies (a meta-analysis) investigated the relationship between how often people step on their bathroom scales and feelings of anxiety, depression, self-esteem, body satisfaction and disordered eating. The study basically found no negative psychological outcomes with frequent self-weighing. So, in most cases frequent self-weighing is harmless and could in fact assist you in losing weight and keeping it off! Many studies have shown frequent self-weighing can help you to lose or maintain weight. Setting a weight loss target and monitoring your progress towards it an extremely simple, yet effective method to support your success. But if you are highly sensitive about your body image, research suggests you might be better off weighing yourself infrequently. In these situations monitoring your progress in other ways, such as tracking the number of healthy eating habits you are successfully executing or the number of steps you are taking, is advised. Doing this allows you to indirectly measure your progress towards your goal. 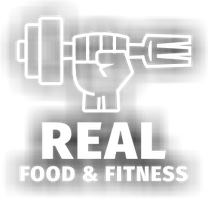 The more healthy eating habits, steps and exercise you do the more progress you are likely to see in terms of weight loss. Other individuals, such as teenagers, those who are consistently losing less weight than desired, and those who are only weighing themselves over a few weeks as opposed to months or years, may also want to avoid frequent self-weighing due to potentially adverse psychological outcomes. So to answer the question of “how often should you step on your bathroom scales” depends upon you and your current situation. HOW OFTEN SHOULD YOU SELF-WEIGH? 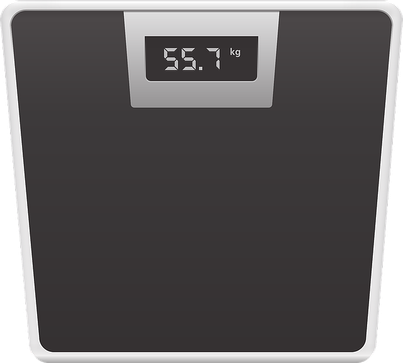 If you are making good progress towards your weight loss goal, frequently weighing yourself is a good idea. If you are feeling frustrated and stuck in a weight loss rut – frequently using your bathroom scales might do more harm than good. Perhaps you should monitor your progress in other ways? If you are overweight/obese, daily weighing can support your progress. If you are a teenager or are very sensitive about your body image, daily weighing is probably not a good idea. 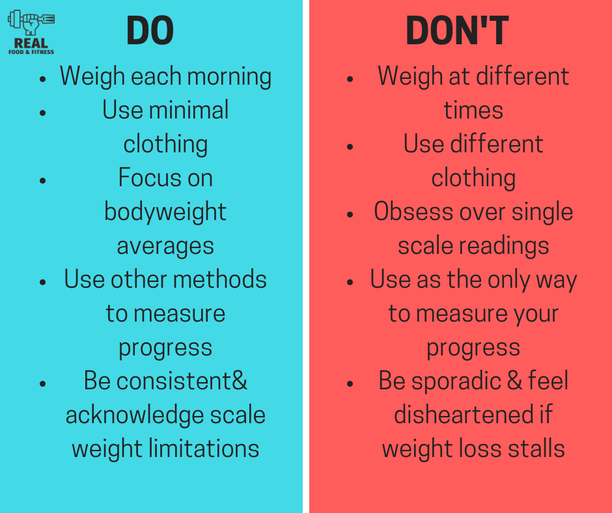 You should probably avoid frequent self-weighing if you have/are suffering with any form of disordered eating. One piece of advice I always give my clients is to monitor their progress in more than one way, because the bathroom scales don’t tell the full story when it comes to weight loss. For example, if the number on your scale increases it doesn’t necessary mean you’ve gained body fat. Scale weight can change for dozens of reasons, including drinking more water, weighing at different times of the day, bowel movements, and menstrual cycles, eating more carbs, eating more fiber, etc. And scales only measure total body weight –they can never tell us what specifically has caused that increase in body weight – it could be fat, it could be water, muscle or several other things as mentioned. A good idea is to take some full length photos of yourself and some circumference measurements of your waist, hips, chest, and limbs every few weeks to use in conjunction to scale weight in order to gain a clearer indication of what changes are occurring to your body. Bathroom scales will more than likely help you to achieve your weight loss goal, but they never tell the full story. Always use additional methods to measure your progress and never attach feelings of self-worth to the number on your scales!